Al-Amin is a 24 years old man from Rangpur. His father was a farmer and his mother was a family planning worker. He was the cheerful eldest son of his parents. After finishing his exams, he was going to his aunt’s house with his mother one day. On the way he stopped and climbed a palm tree to help a friend who was collecting juice. He suddenly slipped and fell out of the tree. Afterwards, he couldn’t remember quite what had happened. The people around him tried to make him stand. Then the village doctor came and sent him to Rangpur Medical College Hospital (RMCH) where the doctors put him under observation. They concluded that as his spinal column was fractured, he would die very soon. He started to develop pressure sores which continued to worsen. The doctors wanted to operate on his broken neck but his parents didn’t consent as they were against mortgaging their land for a dying son. He was discharged from RMCH after five weeks’ stay there. His condition started to deteriorate as a result of lying on his bed at home. 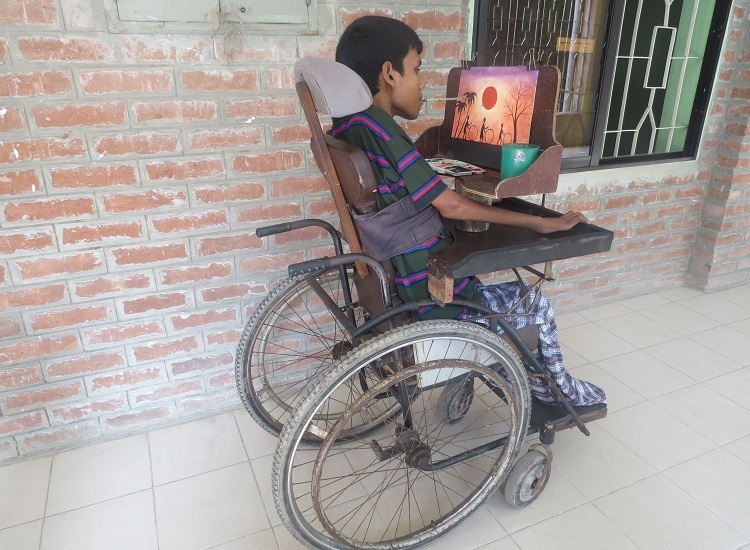 His mother was advised to take Al-Amin to CRP in Savar. She immediately brought him to CRP, and CRP’s doctors counted 52 pressure sores on his body. He was kept in a separate room because of the terrible smell from his sores. With proper nursing care, several blood transfusions and an improved diet over the following two years, the sores completely healed but he lost one of his legs due to osteomyelitis under one of the sores on his knee. Sitting in a wheelchair, Al-Amin began to practice drawing and painting with his mouth. After he was discharged from CRP, Al-Amin’s father left the family and the family rented a house near CRP. Al-Amin was keen to continue his studies and with CRP’s help, he was accepted for admission to the Bangladesh Open University. He passed his Secondary School Certificate (SSC) exam in 2012 and his Higher Secondary School Certificate (HSC) in 2017. Now he is planning to enroll in an undergraduate programme. Al-Amin receives help from Mausher Jonno Foundation (MJF) and other individual donors in the UK and Canada. His younger brother is his best friend and the most helpful person to him at present.